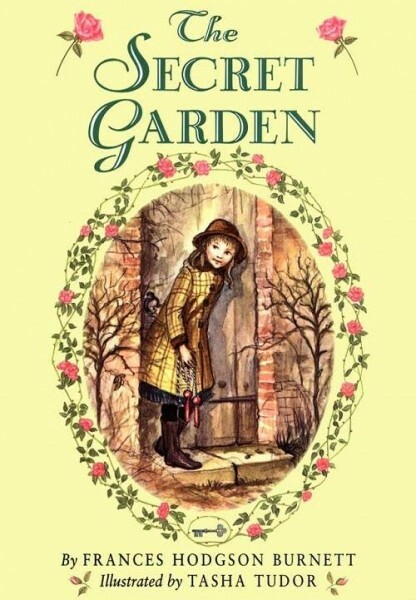 I am finally reading The Secret Garden, one of my all-time childhood favorites, to my own kids. I've been almost reluctant to do so, since I wasn't sure they'd like it, but I'm pleased to find they do so far, and that the writing has held up wonderfully over time. It's crisp and wry and intriguing, and a delight to read aloud. It's no wonder I love it, since as many people have noted, it's essentially Jane Eyre for children--lonely girl arriving at big house on the moors with a lot of shut-up rooms and mysterious goings-on, and ultimately finding love there, though in a familial and friendship way here rather than romantic. And of course it adds in the redemptive powers of gardening and fresh air, which anyone ought to be able to get behind. A few years ago I did finally read A Little Princess by the same author, and liked that too, but not quite to the same level of love that I hold for The Secret Garden. I think that's not only because of the Gothic-lite appeal of the setting in the latter, but because of protagonist relatability: much as I wish I were like the saintly Sara Crewe (of A Little Princess), I am undeniably far more a Mistress Mary Quite Contrary. I feel ya, Mary Lennox. One of my favorite books as a kid too. I never made the connection before but how true--Jane Eyre for children indeed! And then Rebecca (by Daphne du Maurier) is like the 1950s mystery version of Jane Eyre. :) I love them all!